What you like to do in your free time ? Post subject: Re: What you like to do in your free time ? 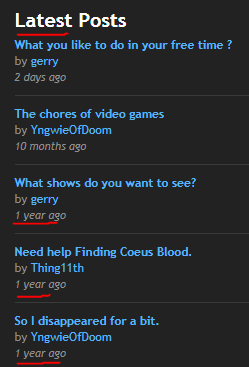 Very nice, Gerry. Thanks again for saying something on a site where we can literally see 3 posts from over a year ago listed as "Latest". Call me by my name if you want (Ashley). I wouldn't praise spam if i were you, Paragon . But you're correct. it's sad to see my past die out on this site. Because this was a great part of my youth and perhaps one of the many things i still miss today. I will check some spam for now.